This just might be the closest we can get to actually visualizing human emotions. 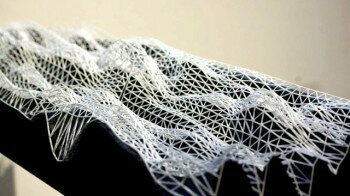 Artist Ion Popian has taken mind mapping to a whole new level, combining technology that maps emotions with 3D printing to create a visual display of a subject’s moods. The project is called “Mental Fabrications,” which involves using an EEG sensor to map brainwaves, essentially turning emotions into pieces of 3D printed art. It works something like this: when we see something we react, which registers as emotions such as concentration or calm, which are picked up from the EEG. Popian explains that while we can’t map out specific emotions, such as happiness or anger, we can map the intensity of the emotions, which in turn are translated into the peaks and falls. Popian and programmer Thomas Martinez then convert the raw data into a 3D printed form of artwork. As it currently stands, the artwork is simply rolling planes of 3D printed brain waves – which are pretty neat. But Popian has another plan up his sleeves, he eventually hopes to turn the brain waves into freestanding 3D printed sculptures, made to reflect human emotions in an even more abstract way. He’s also transformed the maps into architectural renderings, as a conceptual exercise.